“The Alps in summer are a pick-your-own bilberry buffet: the bushes line every path, laden with temptingly sweet little fruits. Cultivated blueberries make a great substitute in this simple tart, which is often served with fromage blanc; greek yogurt works equally well.” – Felicity Cloake. For the pastry, put the flour in a large bowl and grate in the butter, then rub in with your fingertips to a breadcrumb consistency. Stir in the caster sugar with a pinch of salt, then slowly mix in the egg mixture until you have a smooth dough (or do this in a food processor). Shape into a disc, wrap in cling film and chill for 15 minutes. Roll out the pastry on a floured surface to about 0.5cm thick, then use to line the tart tin. Prick the base all over with a fork, then chill for at least 30 minutes. Heat the oven to 180°C/160°C fan/gas 4. Line the pastry case with non-stick baking paper and ceramic baking beans or uncooked rice and bake for 15 minutes, then remove the paper and beans/rice and bake for a further 5 minutes until golden. Spread the ground almonds over the base, then add the fruit. Bake for 20 minutes, then sprinkle the sugar over the filling and bake for another 20 minutes. Turn out and serve warm or at room temperature with fromage blanc or greek yogurt. 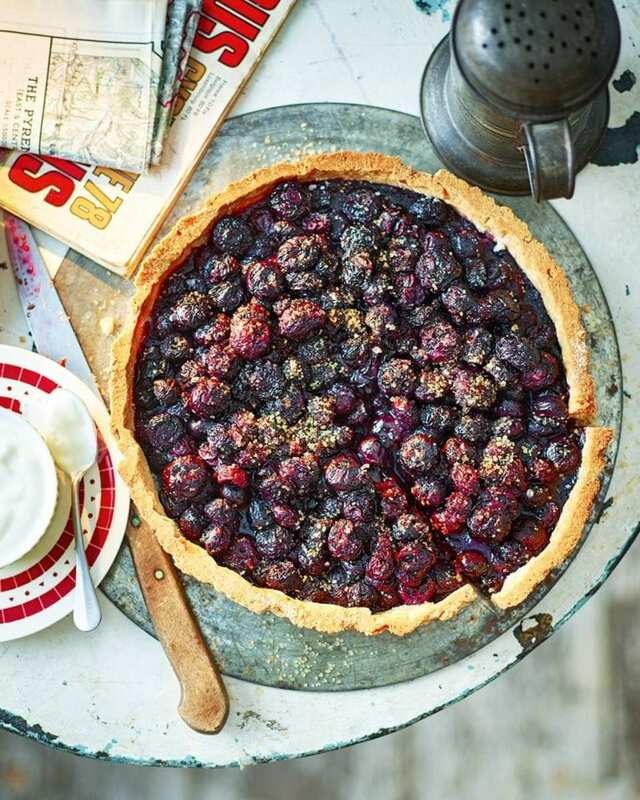 This tart is best eaten the day it’s made or the pastry will become soggy. a Loire Valley sweet chenin blanc.